LOCATION.--Lat 40`29'05", long 78`01'09", Huntingdon County, Hydrologic Unit 02050302, on right bank 170 ft downstream from Smithfield Bridge on State Highway 26 at Huntingdon, and 0.8 mi upstream from Standing Stone Creek. PERIOD OF RECORD.--October 1941 to current year. 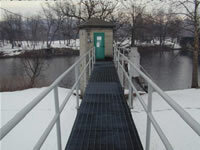 Gage-height records collected in this vicinity for the period May 1895 to December 1938 are contained in reports of U.S. Weather Bureau. Prior to October 1950, published as Frankstown Branch Juniata River at Huntingdon. GAGE.--Water-stage recorder, crest-stage gage, and heated tipping bucket precipitation gage. Datum of gage is 599.69 ft above National Geodetic Vertical Datum of 1929. COOPERATION.---Station established and maintained by the U.S. Geological Survey in cooperation with the U.S. Army Corps of Engineers, Baltimore District, and the Pennsylvania Department of Environmental Protection. REMARKS.--Flow slightly regulated September 1941 to June 1972. Since December 15, 1985 low flows slightly regulated by Warrior Ridge Hydroelectric Plant, 4 mi upstream (reservoir capacity 400 acre-ft). Supplied by NWS: Action stage-9 ft; Flood stage-12 ft, high water will begin to affect the Ames Plaza on the right bank or south bank; Moderate flood stage-13 ft, several homes located outside of the levee system will flood; Major flood stage-15 ft, a number of homes outside the protective works and along Standing Stone Creek will flood; backwater on Standing Stone Creek also affects the athletic field.